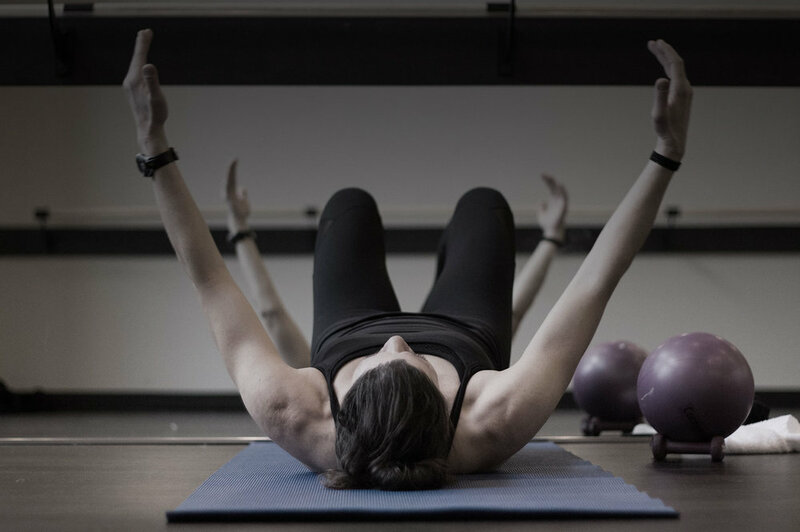 Our barre classes are designed to allow everyone to enjoy a great workout. We welcome all ﬁtness levels and offer modiﬁcations for all exercises.Wear comfortable work-out attire (Some classes require shoes. Check online for details. Socks are optional), bring a water bottle and yoga mat. We supply all needed props. We encourage new clients to arrive 15 minutes early to get a tour and meet your instructor. Below is a brief description of the variety of Barre classes we offer. Barre Burn is a 60 minute barre infused cardio class. It alternates barre inspired movements with burst of cardio activity. The intention is to increase cardio and muscle endurance. It’s an all-level class that’s perfect for the beginner or seasoned gym goer. This class utilizes heavy, weighted movements to create long, lean muscles. By focusing on small, precise muscle movements we create muscle endurance and increase metabolism, which allows you to burn fat all day. A 45 minute class designed to strengthen and tone your core muscles. There are modiﬁcations for all exercises, so it’s perfect for anyone wanting to target not only their abdominals, but also their pelvic ﬂoor muscles, obliques, spine, dorsi muscles, and glutes. A traditional barre class, but in our hot room. The temperature is between 80 ̊F and 90 ̊F. SBL offers a unique twist on traditional yoga methods. We teach fusion classes, which allows our highly-trained instructors to combine traditional yoga poses in a ﬂow format. We allow every level of student to attend any our classes, because our instructors are taught to teach to all levels. All yoga classes are taught in our upstairs Hot Room. The temperature is between 95˚F and 104˚F degrees. Wear traditional yoga clothing, bring a yoga mat and water bottle. We have mats available to rent. Below is a sample of the variety of yoga classes we offer. Please call or email if you’d like more information or have questions. This Asana-based practice infuses Hatha asanas (posture) with pranyama (breathing techniques) and meditation to help students broaden the understanding of yoga postures and their own bodies. It focuses on proper alignment to work toward a full expression pose while focusing on particular muscles and areas of the body. Movement and breath join together to create a dynamic ﬂow of poses with a focus on building upper body strength and ﬂexibility; generating heat and elevated heart rate to improve endurance, focus, and stability. A slower-based version of our traditional power vinyasa class. This class will familiarize you with basic vinyasa postures, focus on how to work with your breath and heat you from the inside out. It is an all levels class. The hot room is generally set to a cooler temperature than our other yoga classes. This Hatha-based practice blends asana (posture) with pranyama (breathingtechniques) and meditation to help students broaden the understanding of yoga postures and their own bodies. It focuses on proper alignment to work toward a full expression pose while focusing on particular muscles and areas of the body. Yoga Nidra is a state between sleeping and waking. The body is completely relaxed and the practitioner turns the awareness inward by listening to a set of instructions; much like a guided meditation. Yoga Nidra practice results in deep relaxation and expands the individual's self-awareness. A gentle style using pranyama (breathing techniques) as you work into asanas (postures) that are held for extended periods of time (three to five minutes). A student utilizes their own body weight and props to gently and safely melt into poses that target the deep connective tissue of the body. Traditionally, this class will only take you into 4-6 poses using gravity and time to get deep into your fascia tissue. This is an amped up version of a Hot Power Vinyasa class. We turn up your internal heat by adding dynamic weighted movements to your power class. This class is high intensity yoga interval training that will push you to your edge. We offer so much more than Barre & Yoga. Our class schedule is always changing and adapting to the wants and needs of our students. We have a variety of unique classes that fuse different styles of barre and yoga together, creating fun combination classes. Wear traditional yoga and barre clothing, bring a yoga mat and water bottle. We have mats available to rent. Below is a sample of the variety of unique classes we offer. Please call or email if you’d like more information or have questions. Come explore martial arts, music, and movement through the Afro-Brazilian art of Capoeira. This class will take you through the fundamentals of capoeira and introduce you to the core aspects of this art form. Learn the basics of kicks, escapes, and music all while improving your own physical strength, flexibility, flow, agility, acrobatics and self-awareness. All levels of students are welcome and all are challenged to excel. Vamos jogar capoeira!